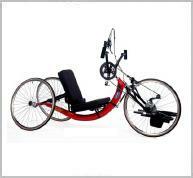 Description: A professional handcycle with 27 speeds made for the serious enthusiast. Description: The Force-2 Handcycle is a great bike at a super price. 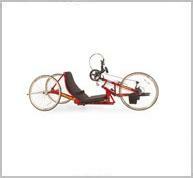 It is a streamlined version of our popular Force handcycle and is ready to ride. Reduced weight and increased adjustability optimizes riding performance. Specifically designed for the serious competitive hand-cyclist, it delivers superior balance and response.